This week, just for fun, I filmed a tour of Clover Hill — the 1826 house that my spouse and I are restoring. This particular episode includes a brief history of the house, and a walk through its large, L-shaped entrance hall. To watch the video, just click the “play” arrow below. Want me to film other rooms in the house? Just drop me a note in the comments field below. I’d love to walk you through the parlor, the dining room, the music room, and the upstairs bedrooms and library. But only if you’re game to see them! 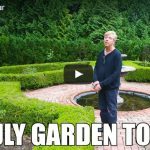 Video: July 2017 Garden Tour! Kevin, thank you for the tour of your entrance hall. I would love to see more of your beautiful home. Your restoration is beautiful ! Would love to see more . I absolutely love the draperies in the alcove, Kevin. They are beautiful! Yes please. Show us more of the house too! This video of your home ( with Lily the Beagle) was charming and yes, I would like to see more. Your home is gorgeous!!!! Thank you for the tour of your entrances hall –you did a beautiful job- yes, I would love to see more of your stunning home!!!! It’s fun to see your lovely house and garden – more please! Keep them coming! And thank you for taking the time to make and post the videos. Your home is lovely and a joy to see. Such fun! Thanks for the tour. I would really enjoy seeing more of the house. I also enjoy your posts regarding how you clean the house. Especially appreciated are your recipes for cleaning solutions. It may seem mundane, but the practical topics and the “how to” demos are really helpful and fun to watch. 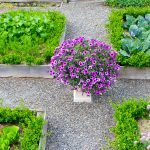 I am planning to begin work on my boxwood edged kitchen garden in the spring and have found your helpful hints and advice invaluable. Thanks again. Enjoy your “work” so much. Kevin, thank you so much for showing us the entrance hall to your lovely house! You and Silverfox did an amazing job! Yes please, let the camera roll! Great fun! Thanks for sharing. Would love to see more. I enjoyed the history you could give along with how you restored things. Yes, this is the first time I’ve toured a beautiful, restored historic house. That was fun. Let’s do some more! Just gorgeous. I’d love to see more. Please do continue the house tour, Kevin! It allows me to be snoopy without appearing to be so! Yes, please continue with the video tours. I love seeing your lovely home. Absolutely want to see the WHOLE House, also am waiting for COOK BOOK. After this tease, of course I would love to see the rest of your beautiful historic home! I love your attention to detail. Love it! Can’t wait for more! Thank you for sharing your beautiful home and yes, I would love to see more! I would love to see every beautiful room! You have a natural gift for giving tours. You were knowledgable, completely at ease and very gracious. The only thing missing was next time please include the cats.. And hope you also do videos of the gardens and any piano playing would also be appreciated. Thank you for the tour Kevin. You and the Silver Fox …. and Lily……have done a beautiful restoration job! I would love to see more of the house. Can I have some Please! Please sir, I want some more. Would love the tour to continue. Thanks! Definitely!! YES!! Would love to see the rest of your restoration!! What you have shown is just beautiful. I love the home homes and cry when I see one falling apart and no one to care for it. Please do continue. How wonderful to see Lily the Beagle again! And just as wonderful is seeing the interior of your home with all of your hard work. This is so obviously a labor of love and your home is beautiful. We would really love to see other rooms in your home, as would all of us who follow your writings. I would like especially to see the home of your (with the help of Sous Chef Lily!) culinary creations, the kitchen! And since I’m a little over the top on pantries, I’d love to see that as well. Thank you so much for letting us come into your home! (And please thank Mr. Silver Fox for us, as well). Thanks for the video. I love historical homes and would love to see more of your beautiful home. Love seeing your home and Lily the Beagle!!!!! Your home is absolutely beautiful and I would love to see more!!!! So very lovely…and yes, please, to more videos of you beautiful home! Your house is AWESOME Kevin! Would love to see more videos! What fun to have a show-and-tell video. Thanks very much. I’d love to see more, please. Yes please I love your recipes and your house is devine!!! Please let’s see No 2!!! Your home ‘s beautiful! Please show us more. Yes!! More house videos, pretty please! I’m game for more tours!!! I love old houses. The stories they can tell are unbelievable. Lovely!! Yes please show us more!! Love the tour! We also own a 19th century home, but it’s far less grand. I can appreciate all the hard work that goes into restoration. I’d love to see the rest of what you’ve done. What a beautiful home you and Mr. Silver Fox are restoring. I definitely want to see more of your home and of course, sweet Lily. More more more! Beautiful and intriguing-bravo! Yes, Kevin more house video please….you should also consider doing a video on flower arranging. Kevin, loved the tour and would enjoy seeing more. Thank you for sharing your lovely home and all the work you and Silver Fox have done. Please do continue on with the virtual tours… I’d love to see some ZOOM IN’s on the detailed woodwork … oh oh and those turn of the century fireplaces as well. Thanks for sharing your home. The love shows in both your home and, more importantly, your approach to keeping authenticity. Thank you for sharing. More, please, along with Lily and Silver Fox….the inhabitants make the home. Enjoyed the tour very much. More! More! you — and Lily & Mr Fox. Enjoyed this – thank you. I love to see restorations of old homes. I would love to see your other rooms. Absolutely love the entrance. I do not normally like the green colors, but the colors you chose are wonderful. I love ALL the wood and mouldings. I just love all of what I have seen so far. I watch all restoration shows. Must be my love of history and architecture. Beautiful house. I want one. Keep the videos coming. It’s nice to see there are people who still appreciate the beauty of the old houses. Thank you saving this beautiful home. Restoring a 1794c home myself…I appreciate all the behind the scenes labor and costs involved. It is a labor of love. Yes please keep posting videos of the rest of the house. You are a natural at presentation. Would love to see more ! Your house is so beautiful! I really enjoyed your commentary on the entrance hall and look forward to more tours in the future. Bonus points if they feature Lily! Yes, please! I would love to see more of your and Lily’s home. beloved Beagle, on your friends, and this website. I love your sense of humor…and I subscribed to you because of your green spatulas, blue rimmed plates & purple bowls – which bowled me over (sorry for the obvious pun) & had me laugh out loud. Yes, yes, yes, please show us more ! What a joy to watch you and that precious pup in the beautiful surroundings of your home. Yes, we want to see all of it! Yes, definetly more videos! I live in an 1822 cape…….not grand like your home, but it has been fun to redo. We, too, are the fifth owners! Loved the first video and would love to see more. Judy K has told me how beautiful your home is and, of course, seeing is believing. You are quite talented! Thank you so much! Great job Kevin. The entrance hall is beautiful. You and the “Silverfox” did an amazing job with restoration. Drapes were amazing and the alcove, tres chic! Love the staircase as well and the red carpet does an excellent job of accentuating the curved, offset but the conquistador. Keep up the great work and I’d love to see more of your home and restoration work. The added history of the house was a bonus! Thank you, Kevin and Lily, for the lovely tour. I found the Conquistador to be particularly interesting. Perhaps there is a story about him somewhere? I surely would love to see more of your historic home. Can’t wait to see more of the house and it’s almost time for an early Fall visit to your garden with a tutorial on what to do now. Kevin, I loved seeing the tour of your entrance hall and of course your dear beagle. The floors are gorgeous! Your choice of paint color enhances the very beautiful wallpaper. The flower arrangement you first show has inspired me to go out to our flower gardens and find the same flowers which I think we have. I even am going to go find a few new hostas after seeing the beautiful hosta leaf. Thank you for each video, and I sure do hope you’ll be doing tours of every room you’d like to share with us. Thank you. Well of course!!!! The teaser…..the front door and the entrance…..how could we not want more. Will Lily the Beagle escourt us through the house? Mine is a 1911, but I also found dreadful carpeting packed in sand and dirt. Thanks, and of course I agree with all the above. Please show more. Beautiful job. Yes !!! We would love to see the rest of the house ! How wonderful, that you were able to preserve this beautiful home! And its’ history. Absolutely beautiful entrance! Appreciate you restoring a piece of American history. I would love to see more of what you labor of love has in store for your viewers. Loved the tour! and now I have a new idea to add my asparagus leaves to my flower arrangements!! More videos! Fun! I’d love to see more. It is gorgeous and riveting! More, more! Such a lovely home! You and Mr. Silver Fox are fortunate to have this project among your raisons d’être! Kevin, this was a wonderful treat. Thank you. Please do more! As always, loved your video…and the house, well! I would say you are lucky to live there, but then I am aware of just how much love and hard work went into making this house a beauty once again and I think that luck has nothing to do with it. Good for you and Mr. Fox! Beautiful home! Would very much enjoy seeing the other rooms. You’ve done a magnificent job of restoration. Thank you for sharing. What a beautiful restoration job you’ve done. The wallpaper and alcove curtains are simply lovely. Your floral arrangements beautiful. I would absolutely LOVE to see more of this gorgeous home. Congratulations on such an exquisite labour of love. Absolutely loved the house–what a beautiful life you lead! Would love to see more rooms–kitchen and living room/parlour especially! Yes, show us more of your beautiful house if you please. How about the music room? Have a wonderful day and enjoy the garden. Let’s see the whole house. It’s lovely and you have done a wonderful job restoring it. I live in a 100 year old farm house that could use some care. I also have 17th and 18th century furniture that I love. I wish my home showed the care that yours does. I hope it makes me get busy! I love your home and would like to see all of it! Thank you. Based on all the comments I sense many angels are getting their wings. What a lovely restoration you’ve done! Thank you for sharing your vision and many talents with us. Sunday wouldn’t be Sunday without a visit from you. I would very much enjoy seeing the rest of your home. Happy you eye surgery went well. I too would absolutely love to see more of your lovely home. I enjoy your recipes too. Love the videos more please! You do a great job with your descriptions and added bits of humor! Love the dog and have made many of your recipes! Kevin, it’s so very nice to see that you RESTORED the house, not REMUDDLED it. So many people buy an antique house and then rip out all of the features that are period-appropriate to be replaced by cheaply made modern junk. This is one of my pet peeves. Your house is gorgeous and tastefully and appropriately restored. In 2000, my husband and I moved a 1902 Victorian house (cut in 4 pieces) 250 miles and restored it appropriately. When hubby died in 2006, I continued to live there but a 6-bedroom house on 2/3rds acre was a bit much for me to keep up by myself, so I sold it 2 years ago. I absolutely LOVE the green colors inside your house and yes, please give us other videos of the house. What a beautiful restoration you have done! I would love to see more. BTW, I love your website and recipes and tips. PLEASE DO, SHOW US MORE OF THE HOUSE INSIDE. ANOTHER VIEW OUTSIDE WITH THE ONSET OF FALL. THANK YOU.!!! WHAT AN INSPIRATION YOU ARE TO THOSE WHO LOVE OLDER HOMES. I appreciate the details, history, wood, etc. How tall are those pocket doors? Do all the rooms have high ceilings? Can’t wait for more. Your restoration is beautiful ! Would love to see more . And thank you for sharing your home with us. This was so much fun and just a beautiful way to start my day! Looking forward to more lovely rooms, nooks and crannies. Thanks for inviting us in Kevin and Yes please, would love to see it all. Would love to see more of your beautiful restored home! Thanks for the tour and hopefully many more to come! 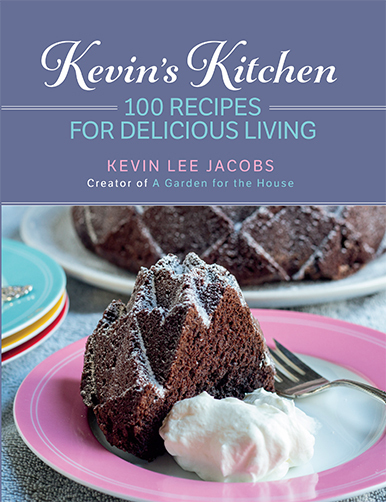 Kevin loved this great video and am head over heels for your garden but where’s the kitchen? Just curious is it on a lower floor or is it a nightmare in progress? I am hopelessly in love with old homes like yours, just afraid of it turning into “requiem for a renovator!” I live in what once was a beautiful quiet suburban village turned posh and trendy in lower Westchester and am screaming to get out! My decorator’s dream….to own a home and garden in an area like yours. Any advice? Well, since I’m like the 110th comment, yeah! Yes! You bet! Bring ’em on, Kevin! Soon please! Still loving every thing you do. Astonishing, ’cause I always think my tastes are not especially mainline…? Go forth and FILM! There is nothing historical that I don’t appreciate as it’s like opening a book and learning of our past. Once it’s gone, people forget and future generations never can appreciate the accomplishments over the years. And some will never believe what is told, rather than shown. We knew we would never be able to own an historical piece of property so what we started doing once we moved to New England, we would do our best to find Bed & Breakfast lodging. It was our way of helping to preserve these historical homes. We aren’t able to travel anymore but may I suggest to anyone looking for a memorable memory to take them through their rocking chair years…stay at a REAL B&B (as some are far from a ‘real’ one.) The fall will soon be here, start looking for a B&B as the fall is the best time for God’s beautiful bragging rights. YES YES more tours of your beautiful home are welcome in my heart. I became engrossed in your tour of the entry hall. Loved it. Keep them coming. Loved the tour and would love to see more! Thank you for opening up your beautiful home to us. I love all of your tours. Please keep them coming. A beautiful home to enjoy forever. Would love to see more of your house. It reminds me of my grandmother’s house, where I spent a lot of time when I was growing up. Her house had two stairways, a fancy one at the front and a plain one at the back for the servants–or perhaps for the children. I don’t think my grandmother ever had servants. I join my voices with the others. Please show us more. We appreciate the photos and the stories. I agree witht he others who posited that once history is gone -it is gone. Thanks for your efforts in preseving your piece of it. Lily is a lucky dog to live in such a gorgeous place. Yes please ,every room every nook and cranny. Love the videos. Can’t forget the lucky find, the hardwood floor! Thanks for the video and the next to come. Appreciate your recipes too, your mom’s recipe from memory? Love mother”s cooking and I’m happy if they pass it down to their children. Thanks for recapturing your mom’s recipe! Love history cooking as well. Can you add the ‘halo’ with the angel wings? I too would like to see your entire house especially the music room with you playing the piano. Thank you for the tour and all your recipes. Kevin, I love your home can’t wait to see more. Beautiful drapes. Game on, Kevin! Let’s tour the whole house. As a fan of old houses, I hope you will continue the tour through the rest of your lovely home and gardens. Thank you for sharing! Also, thank you for not adding an apostrophe to 1960s! Finally, don’t you dare stop calling out the color of your dishes and tools. I’m a proponent of colorful kitchenware and hope you will continue this practice. Party on, Kevin! Please video each room. I love your inflection and sarcasm. Give Lily some love for me. Next!! Hope we will be able to see more of your beautiful home! 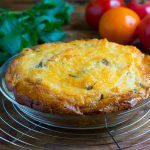 I recently discovered your blog and have tried 2 of your recipes – Blender corn and herb souffle and Tomato pie. Thank you for sharing, they both were delicious. You and Mr. Silverfox have done a beautiful job restoring your house. I would enjoy seeing the rest of it. Keep up the good work. Yes, please! Your home and garden are beautiful. and she certainly looked poised on the stairs and ready to continue on with the show! Will be looking forward to seeing both of you in the next video! that has gone into it. How much of the actual hands on work did you and the Silver Fox do? And, could you include how long it took for you to do each room or area? I love your tours, keep it up. Yes, I’d love to see more! YOU look like a silver fox in your black clothing–very sophisticated, and it works well for videoing. enjoyed your weekly email with all of the good recipes. Thanks..
and that amazing alcove arch. The game tables fit in so perfectly. painter, my eyes went to the gaps on the right corner of the chair rail. He uses “Bondo” on problem areas so I wonder if that might fill the gaps. I can see why the winding stairs sold you – gorgeous! Lily is certainly a “Mellow-Fellow” (“Mellow Missy?”) on the stairs with you! Thanks for the tour, Kevin. And, yes, more please! This wonderful home could not have come into the hands of a better detail and loving caring person. It’s a perfect match! I’ve been in the Estate Sales business for 30 some years and so totally appreciate all that you have so beautifully and correctly accomplished here. What a pleasure to see something so well done and cared for. I look forward to the Sunday edition of your videos; what ever the subject matter of the day is. Would love to see the “whole” house if you’re so inclined. LOVE WATCHING YOUR HOUSE TOUR VIDEOS. WOULD LOVE TO SEE MORE, MORE, MORE. I admire and appreciate the care and hard work you have put into restoring your home to its former glory. I love your home! It’s gorgeous and I would love to see more. Thank you for sharing this personal part of your lives. Yes, Yes, Yes! Kevin, what a treat….will you consider walking us around the beautiful porch showing the grounds from that perspective? Thank you for sharing your home will all of us! How Fun! If the conquistador lights up the entry to the stairway, it would be cool to see that! What a unique feature and conversation piece! Your home is a labor of love and respect for American history. Yes Kevin, I’d love to see more. Thank you for everything that you post. Garden food and now your beautiful home. I’m definitely a fan. And today as I toured the house with you my husband was looking over my shoulder…..a new fan! Continued love peace and joy to you! Beautiful! More, please. Really want to see that dining room. Thx for sharing. More please. I love the historical knowledge you have about the house! You’ve done a beautiful job with your old home. I’d love to see more! What a beautiful home. You have done a lot of work! Would love to see the rest of the house. Looking forward to more tours! Thanks for wanting to share your beautiful home & gardens. It certainly represents the hours of hard work you put into your home. A labor of love. Loved the first part of the tour. Waiting for the next room. Really enjoyed the tour – please create more! Thank you! More? Need you ask? For those of us who love old houses this is a special treat. What a treat! I would love to see more. Kevin, it’s good that you care enough about the house to have researched it and that you respect its original structure. I look forward to seeing what you’ve done in the other rooms. Thank you for the tour. Of course, Kevin! I love your videos and am waiting for the next one. Much better than just photos. Thank you, Kevin! You are a gifted decorator. I thoroughly enjoyed the tour of the entrance hall, and would love to see more rooms. Thank you for sharing your beautiful old home. What a beautiful home you both have Kevin ! I love antiques and it is a joy to watch your video. Yes please, I would love to see more. Take care . Love from New Zealand. Yes, I would love to see move videos of your beautiful home. I enjoy all your posts and do enjoy your great sense of humour. I love seeing your most beautiful home being restored, thank you for showing, and I look forward to further videos. My Husband and I Love Antiques and live in an old Italianate,built in 1850.I thoroughly enjoyed the tour and appreciate the diligent restoration work ! It is a most BEAUTIFUL Home you both can be very proud of 🙂 Please add more videos ! Fond Greetings from Maine ! I appreciated your video. Your house is so beautiful and your love vibe comes through loud and clear! Thanks to you and your loving partner for showing your labor of love. Kev, does your home have ghosts? Maybe an idea for an October video?? Thanks for the tour, look forward to seeing the rest of the house. I so enjoyed the tour. So much love is poured into the restoration and the video shows us that. I would like to see the rest of your home. Thank you. The tour was just great..you are a natural Docent..Your house is lovely..yes, please show us more…thanks.. Yes, I want to see the rest of the house. Thank you for sharing with us. Please, more tours of your beautiful home. I love the restorations, they have a fresh, airy feel. Would love to view the rest of your home. Beautiful house ! and love the name Silverfox ! Yes, please, Kevin! More videos! Such a beautiful home. Thank you for sharing the photos with us. Its very homey and generous of you to take time and share your house and absolutely magical home with all of us who are smitten with your garden and recipe sharing. Saved and transformed clover hill, your kindness and sincerity shine. Silver Fox – as you say you have saved such a beautiful piece of American history and encourage others to consider doing the same . Thank you sharing the simple pleasures in life and inviting so many other kindred spirits to your home and garden. You are to be congratulated for your commitment to the restoration of your house. It looks absolutely beautiful. The draperies, the wallcoverings, the rich deep red carpet on the stairs is so elegant. The conquistador is awesome. Keep up the great work and I will be back to see the next episode. Yes! Please keep the videos coming. It’s inspiring to see what you and the silver fox have accomplished. I enjoyed this tour very much and looking forward to seeing more. Thank you for inviting us all into your beautiful home. And yes, please! More, more, more! Lily The Beagle is beautiful, and your home is stunning! Please do more videos!! What a joy to see a historical home lovingly restored and preserved. My daughter and son-in-law bought an 1899 five bedroom home in Cape Charles, Va. and are doing the same thing. Yo are so right about the effort being woth it and saving a bit of American history. Thank you for sharing your home and creativity with us, Kevin. You rock! Yes, yes! More please! Thank you, Kevin. I just love your home! Restorations are blood, sweat and tears but you are smiling now! Enjoy everyday in your lovely surroundings. I liked the history synopsis of your home. Yes, I’d enjoy seeing the rest of what you have done and perhaps, if anything, what is to come. Had to laugh at LILY giving the camera those sly looks, so cute. Thank you for so graciously sharing your beautiful home – YES I’d love to see more.
. . . and what a lovely lady your Lily the Beagle! Beautiful, Yes, more please. Thank You for sharing with us. LOVE, love, love Kevin. Beautiful home, great tour, looking forward to more in the future. 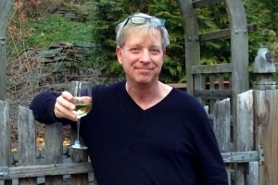 HI, Kevin….thank you for sharing your home…….loved the elegance and the history…..more , please! Beautiful. I was ready to peek in to the other rooms. Love all of the wood detail throughout your home! Yes, please continue to show us more! I love the wallpaper in the foyer. It is so elegant. I own some antique furniture and dishes handed down in my family so I certainly love visiting vintage homes. More please. Please continue! I so entire all your postings! I love historical homes! Our son is living in a stone ‘tenant house’ in MD that was used while the huge stone grist mill was built across the road. You would love how the mill has been restored and now being used as a personal home. The water is flowing thru the huge paddle wheel. You can view it from the glass wall in the dining room! By all means video your lovely home! More, more, more! Everything is beautiful. Would love to see more of what you have done to restore your home. Enjoyed the house tour and looking forward to many more! Kevin, your posts and videos are informative, beautiful and most of all, entertaining. Your hard work is on display. Thanks to you (and your spouse) for giving us this piece of history. Naturally we want to see more!! Yes, please! Love the video…. What a beautiful home. And what a ginormous challenge to take on! Love it! Please keep the beagle in future house videos. I loved your house tour and it was a treat to see Lily the Beagle. I look forward to seeing more tours. Your home is beautiful inside and out. Your gardens are just as beautiful. Yes, I would like to see more of your rooms! What a lovely front entrance Kevin! We will all anxiously await more videos. Did you take before pictures of the rooms, too? I really enjoy seeing what it used to look like and what you have done with it. Also, I like hearing that you and Silver Fox took up the ugly carpeting yourself and how awful that was! These details are what keep me coming back, along with the easy commentaries. And, I certainly would love to hear a complete piece on the piano when you get to that room. Please move through the house for us. I would absolutely love to see more of that beautiful house. So well restored and a great things you both are doing to preserve history. Thank you so much for sharing this. I am sure seeing it in person is even more of a treat to the eyes! Yes, please show us more of your lovely home. Thank you for the tour. I loved the flower arrangement. In fact, your flower arrangements have inspired me in many different occasions. Thanks for the awesome ideas! I would love to see more of your house. Make sure to include Lily, the beagle. Adorable dog you have! I am so envious. I love looking and hearing about history and buildings. If only walls could talk!! Yes, would love to see more of the house. Yes! Yes! More please, and please make sure Lily the cohost is on the job. Loved it! Would like to see more please! LOVED every part of the entrance hall video and won’t repeat from the 213 preceding comments except to say, “YES, more house tour videos, please,” and how kind you are to share them! You are a delight, and so is Lily. I would love to see the rest of the house. Absolutely lovely! So happy I found you Kevin! Loved the video. Please show us more! Beautiful- would love to see more !!! Thanks for the tour Kevin. Your love of your home shines thru in the care you have taken in rescuing it. Beautiful! I would love to see a video of the library and dining room. Please. I would love to see more videos of your beautiful home. It is very inspiring to see the before and after. Thank you for taking the time to do these! That was lovely. I would love to see more. I love Lilly. Thank you. What a beautiful home you have! And dear little Lily is such a lady of the house. Don’t you have a couple of cats? I would love to see them in the next video. Please do keep the videos coming. Would so enjoy seeing the rest of your house. but I do not have a room as big as yours!!! You’ve done a great job on your house–would love to see more. Beautiful job on a beautiful house. Please show us more! Your home is exquisite. Loved hearing the history of the house, and your description of the renovation. Would love to see more..Thank you for sharing. Yes, please, Kevin, LOTS more! I can tell it’s been a labor of love…..
You are a devious man Kevin. Giving us just a small taste of your lovely home. The quick looks of the other rooms make us just want more! Please don’t take long before filming the rest. PLEASE, PLEASE show us every nook and cranny. Not kidding, they are always the most interesting. Seeing how inventive people are with only hand tools. Have your recipes posted all over the side of my fridge. Kevin, it’s amazing! Please show as time permits. Love the website. Restoration done to perfection. Your passion and love ooze through the video. Very lovely and rewarding. Thanks for sharing. Hugs and kisses to lily. Waiting in anticipation for future videos. More, more,more! My home was built in the late 1700s. It also was in dire need of someone to appreciate it! A lot of work but oh sooo rewarding! Looking forward to seeing more of your gem! Gorgeous home! Would love to see more!! Can’t wait for future videos! Kevin,enjoyed your video.Such a beautiful home.Please,do more tours especially of the music room.Would love to know the history behind the pianos and how you got started with playing.Also,love the different colored spoons and the little plastic people! Oh, Kevin– your home is so lovely! I would really love to see as much more of the house as you are willing to video for us. Thank you so much for this visit and for those to come in the future. Yes! Absolutely breathtaking & jaw dropping, I love you and the knowledge you share along with the many photos and recipes! Please keep them coming! Oh, how absolutely delicious! 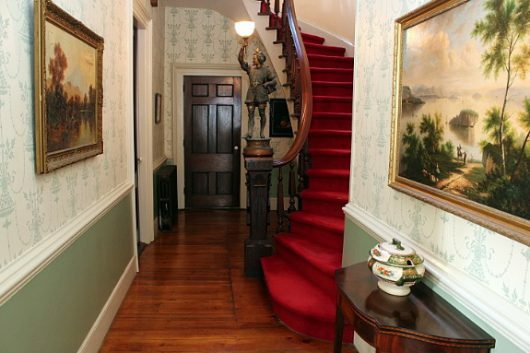 I love the soft greens, the moldings, staircase, furniture, and window coverings! More, s’il vous plait! Gorgeous, stately yet homely and welcoming. I’m going to copy your Christmas table setting this year…uncomplicated for myself to do, and colourful for my young Grandchildren to enjoy. It’s also more suitable to our Hot Hot Christmas season weather here in Australia. Thankyou for sharing your home with your many followers. I just stumbled upon your website. So happy I came upon it. I love your beautiful home and the fact that you are keeping and restoring, as you stated, a part of our American history. Also, Lily, besides being so cute, is the perfect little co-host! Please count my vote to see more of your home. Thank you so much for sharing everything! I am a subscriber to your email. I am reaching out to you because of your house tour, love of history, and preservation efforts. I am in mid Missouri. My 96 year old mother who shared similar interests recently passed away leaving the family a legacy of grace and a player piano that needs someone to love and restore it. There are 8 music rolls, not sure of their condition. Do you have suggestions where we might contact people who would be interested in it? Thank you for pointing out the materials and process to restore your home. Beautiful work. What fun! I love seeing what you have done with it. It is beautiful! Love the history and the details. Keep going! It would be fun to see a floor plan of the house, too. Magnificent restoration. Thanks for pointing out all the little details and history. Very enjoyable, more, please. Library, please! Loving what you’re doung with the house. More more MORE! ( Quick whiff of smelling salts, here in my old Victorian…) ! You had me at African Violets, and you will never be rid me after Herb Garden! The Entrance Hall! The Parlor! The Dining Room! But, oh. The July Garden. Just: more. Never stop. LOVE you. Of course, ALL of us do! More please!! How about seasonal tour of your decor for various holidays?? Loved this tour! What a great beginning for your house tour. I’m just fascinated by the whole idea of restoring an old house. It is rude of me to ask but I hope in a future video you’ll let us know what your final plans are for the house. After so much care and attention to detail it seems like it would be hard to sell it. But like you say, you are preserving a part of history. Best it should bring warmth and happiness to a new family when it is done. I want a slower view of the dining room please. Yes, more, more,more! Yes, please show more. Can’t wait to see the kitchen where all the goodies are prepared. The house is beautiful. Is that wall paper flocked? Hi and Happy New Year Kevin and Lily and Mr. SilverFox too!! Thank you for the tour! What fun and how nice you made the place. At the beginning of the video, when you show the before pics and the wall was red, I was intrigued by the bright, primary coloured, patterned curtains. Can you share more info via here or email about the fabric and design and if it was vintage or modern material? It tickled my eyes and made me smile to see it! How very nice of you to share something so special with us. Hope the weather is being gentle to your garden. Freezing over here in Buffalo. Beautiful taste! and exquisite workmanship. I’d love to see all the lovely rooms in your gorgeous home! Your house looks so elegant. I’d love to see more! It’s obvious how much you care about your home and I appreciate that you have shared the beauty in videos. Looking forward to more. I didn’t know about Linden trees – now I do, thank you. You have exquisite taste. Please show us more of your fabulous home.